Does anyone know the Timken part numbers for the inner and outer cups for tapered roller bearings? If you get them from a bearing supplier, you will likely pay more than from a T parts vendor. One of the vendors seems to have a deal with Timken and then wholesales them to other T parts vendors for less than they can get them directly from Timken. My bearing supplier can get everything cheaper for me. The only exception is the threaded outer bearings. They tell me someone is ordering the bearing and then cutting the threads. Andy, Please email me info on your bearing supplier... I've tried a couple national chains and had no luck finding them at any better price than the major T parts vendors. If this is competitive let me know. These are my straight costs. 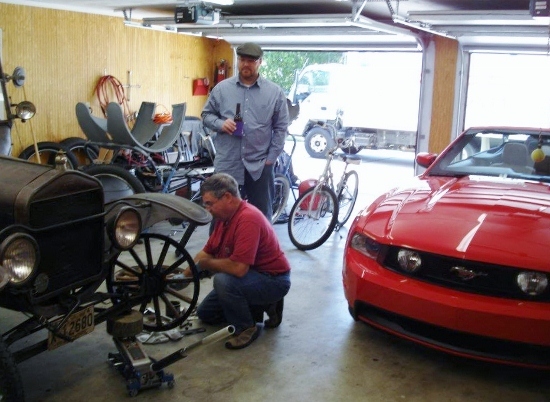 and showed the son-in-law how to adjust wheel bearings....only a bit of interest, as he is a Ford guy....that red GT convertible parked next to Nellie is his ride. But Bill is more of the go fast type. Outer bearings are more expensive. Something must be missing here if he can get them for under $7. Those are the prices for those part numbers. If there are other parts involved, then I would need the part numbers for those as well. Again though, these are MY COSTS as a Timken distributor. There's huge mark-up in retail on bearings and v-belts..
Dan thats a good price mine costs me almost 70-80 per cent more then that. The part numbers in this thread are for the races (cup) only. Lang's sells the outer race (cup) for $7.45 and the larger inner race (cup) for $16.50. Sure is nice to use new ones in each hub. $16.50 for the cone is a great price if it's genuine Timken. 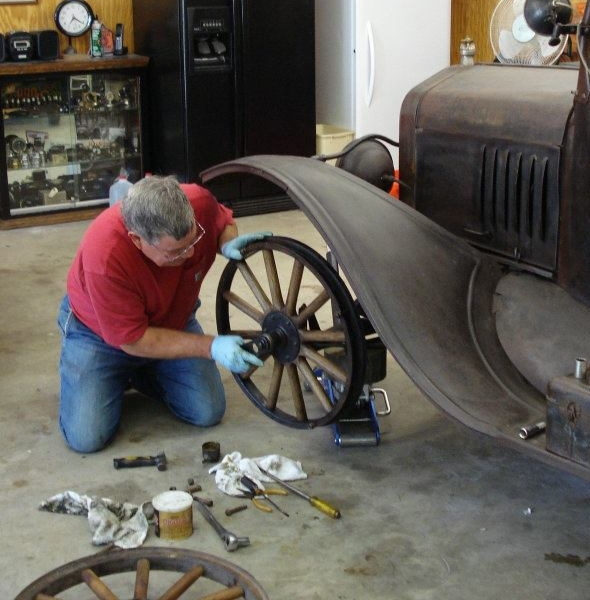 Dan, what is that big round item on top of the floor jack? Adam, I have to eat my words. Last year I picked them up for 17 and 6 something respectively. Yesterday, he told me 27 and 8.75, so I guess that I need a better source. If you're getting genuine, threaded, Timken cones for $27 count your blessings.